The first Paddington Bear story was published in 1958 and was written by Michael Bond. 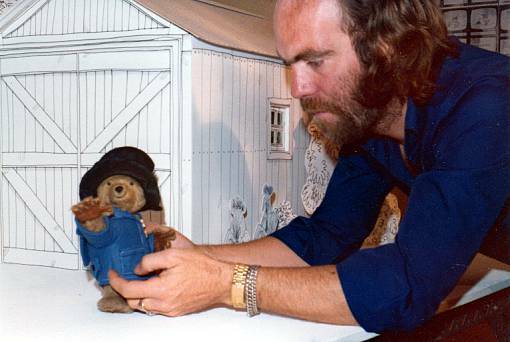 The Paddington Bear TV series was first aired in 1975 with puppet and drawn animation by Ivor Wood. 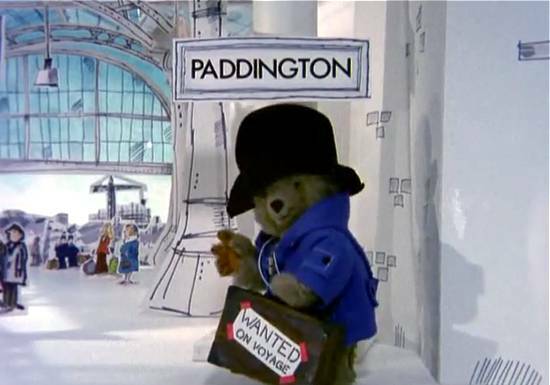 In episode one the bear is spotted by the Brown family on Paddington station where he had arrived from Darkest Peru as a stowaway. He had a label round his neck that read “Please look after this bear, thank you”. In no time at all Mrs Brown named him after the station and he became part of their family. Paddington Bear in episode 1 of the original TV series (1975). Paddington Bear was developed into a soft toy by Shirley Clarkson in 1972. With no business experience, no capital, and just £100 of backing, Shirley came up with the original – now classic – Paddington. She grew her company, Gabriella Designs, from a tiny spare-room business selling tea cosies in Doncaster into an international business shipping Paddington Bears all over the world. 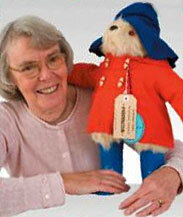 Shirley Clarkson with her soft toy version of Paddington Bear. Manufacturing from a collection of ramshackle farm buildings, she was hit by a wave of orders from retailers, as the world went Paddington crazy. Then things went horribly wrong as staff went on strike and 50,000 bears had to be recalled because of faulty eyes. Shirley watched her business collapse. Now Paddington Bear is to take to the big screen in a production that is to be a mixture of live action and computer animation. The film is being produced by David Heyman, the man behind the Harry Potter films. The Sun newspaper reports Mighty Boosh star Noel Fielding has been signed up to play Paddington Bear’s cousin – a half man, half beast who, like Paddington, comes from Darkest Peru. It is understood the new film will be based on an original screenplay inspired by the various characters and episodes in Paddington’s life as told through Bond’s books. It is being co-written by The Mighty Boosh director Paul King and Hamish McColl, co-writer of 2007 comedy film Mr Bean’s Holiday. Paddington Bear has much in common with Mr Bean; both are very polite and very accident-prone.